When you need to grow your Fusion DX800RAID's storage capacity, Sonnet offers an economical upgrade path that is simple to deploy—Fusion DX800RAID Expansion storage systems. Each DX800RAID storage system features an internal SAS (Serial Attached SCSI) expander that enables you to connect additional DX800RAID enclosures in a daisy chain, no additional RAID controller card needed. This simplifies installation and significantly reduces your cost to expand capacity. As a matter of fact, incorporating more storage capacity is nearly as simple as placing additional DX800RAID Expansion storage systems near your computer and connecting a few cables. 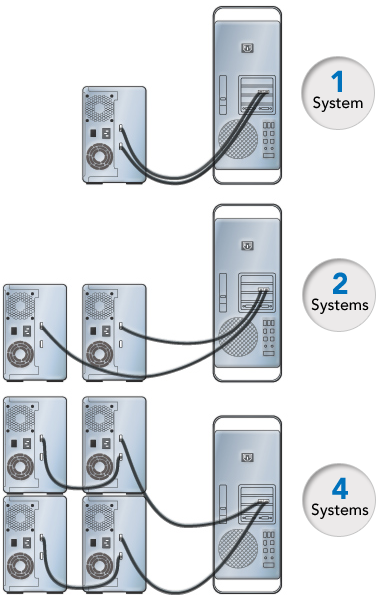 The reliability of the Fusion DX800RAID Expansion system is further enhanced through SES (SCSI Enclosure Services) 2.0 compliance, a feature more commonly found on enterprise storage systems, and enhanced S.M.A.R.T (Self-Monitoring Analysis and Reporting Technology) data reporting for each hard drive installed in the system. Built into the Fusion DX800RAID enclosure, SES functionality provides enhanced real-time monitoring and reporting of drive, power supply, and temperature status, with real time results displayed in utility application screens and the illumination of conveniently placed LEDs on the enclosure. S.M.A.R.T. data criteria can be used to notify you of an impending drive failure and enable you to minimize downtime as a result.